The best part of MusicBox Studios is that the day-to-day environment is entirely shaped by the projects at hand. One week can be entirely spent in between spotting sessions, meeting with directors, and coordinating internal logistics within the office. This week was no less of a whirlwind with playback meetings, in-house recording sessions, writing, and problem solving. When that extra dose of humor was needed for a cue, and the quintessential triangle surfaced in the studio, the obvious answer seemed in sight. However, without its accompanying hardware, there was a brief moment of questioning how to find a stop gap so the cue could be finished. 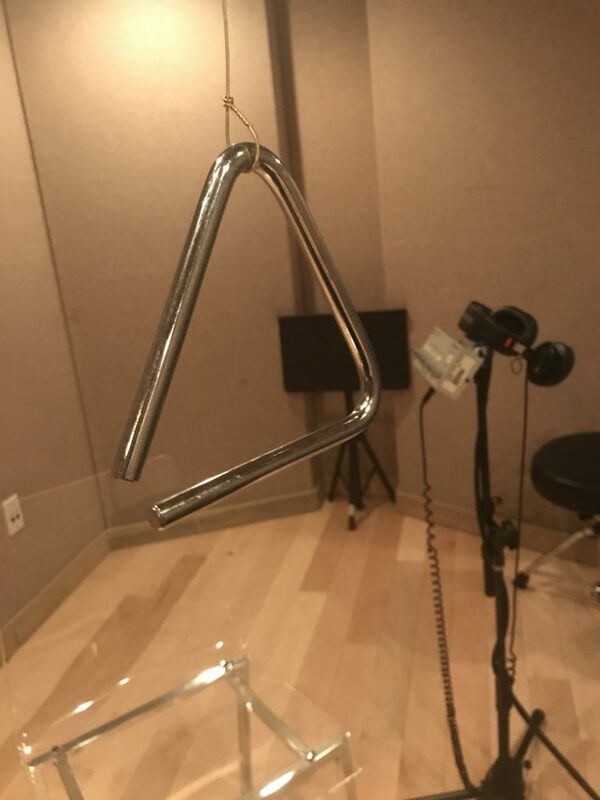 Jeff took it upon himself to go back to his roots of rocking out with his Grammy-award-winning band TONIC and turn a guitar string into the perfect temporary holder for the triangle. It’s moments like these when you realize how thinking outside the box is not only occasionally useful, it’s sometimes the difference between finishing the job in a timely manner or not. Happy problem solving!